Just updated Diablo III with the new 2.0.1 mega patch. 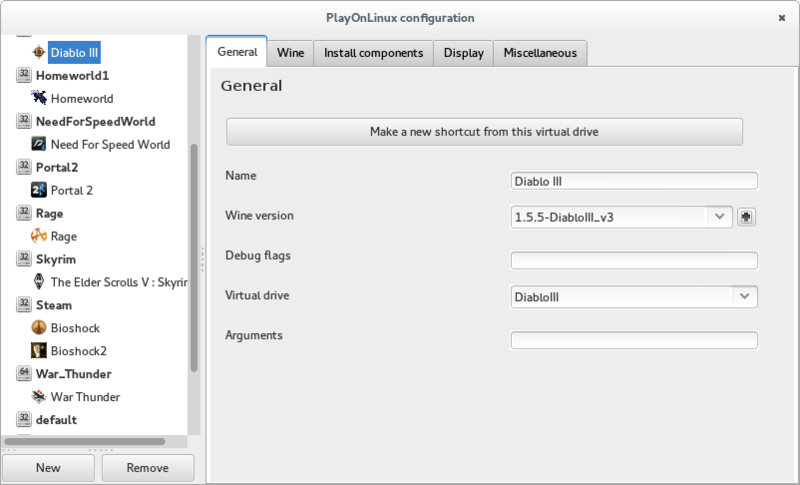 Diablo III was originally installed using PlayOnLinux’s Diablo III installer which installs the game under a custom version of Wine 1.5.5. The 2.0.1 update not only upgrades the game but also updates the Diablo launcher to the new Battle.net launcher. First impressions of the game after the big update were great which worked flawlessly. When exiting Diablo III following the update and restarting you are then prompted to install an update to the Battle.net launcher, after the launcher update it crashes preventing you from being able to launch the game. Unhandled exception: page fault on read access to 0x00000009 in 32-bit code (0x7e8cbc2c). 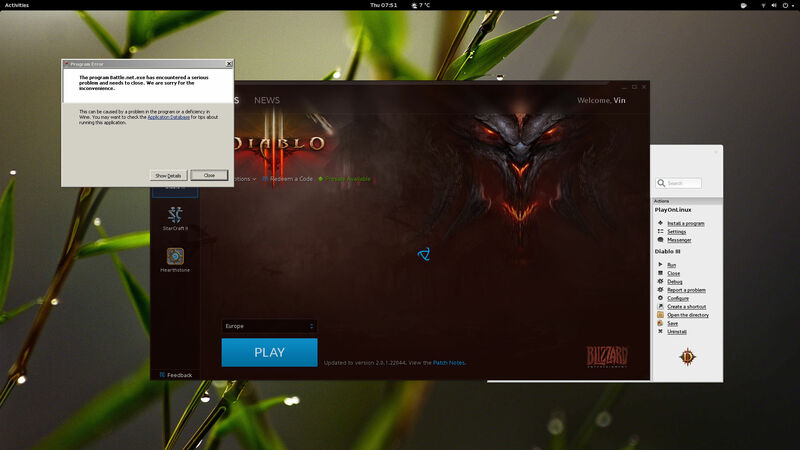 [UPDATE]: Thanks to luke10 for posting a link to a thread on the PlayOnLinux forums regarding the dbghelp library this has also been discussed in the thread on the Diablo III forum too. Running the Battle.net launcher (and Diablo III under a later version of Wine) fixes the Crypt32 error and delays the launcher from crashing long enough to allow you to launch a game. 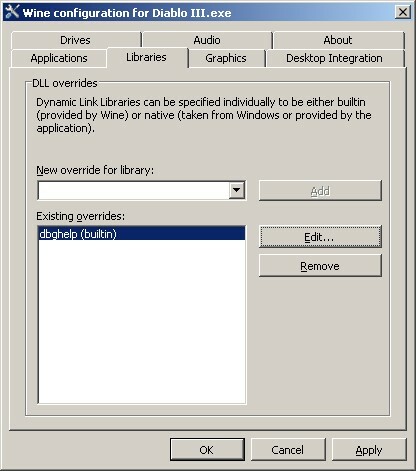 This alone does not stop the launcher from crashing later on, to fix that one must also disable the ‘dbghelp’ library in wineconf, however Diablo III requires dbghelp so disabling for the whole wine instance breaks the game so dbghelp must be enabled for the game. 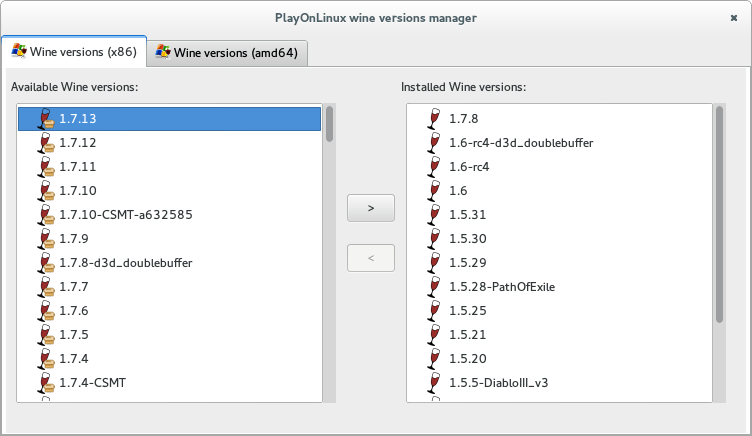 In the wine version manager window select the 1.7.13 1.7.16 in the left-hand “Available” list and select the [>] button, this will trigger PlayOnLinux to download this version of Wine. Once finished version 1.7.13 1.7.16 will be visible in the right-hand “Installed” list, close the window. 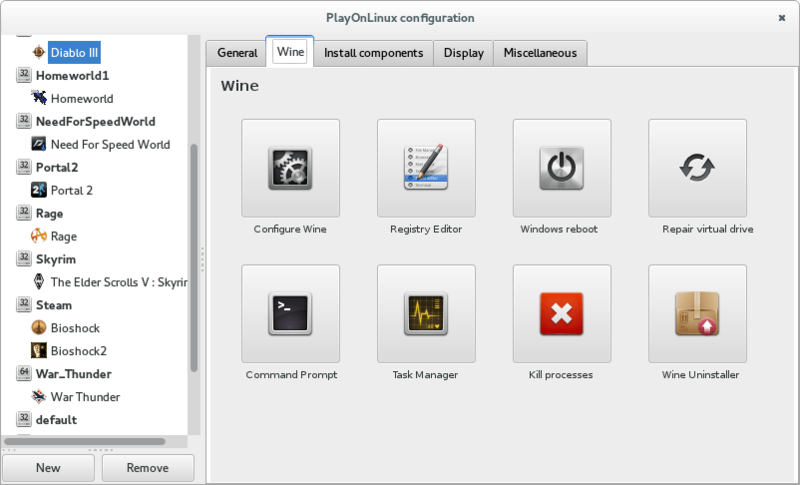 Select the Wine tab and then the [Configure Wine] button. 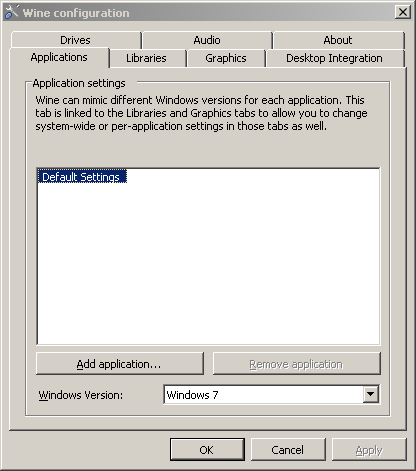 This will open wineconf, under the Application tab ensure the Windows Version is set to “Windows 7” before selecting the [OK] button. Select the [Libraries] tab, enter dbghelp in the [New override for library] field, then select the [Add] button. With the dbghelp selected in the list select the [Edit] button and select [Disable], then [OK]. Now select the [Applications] tab, select [Add application]. 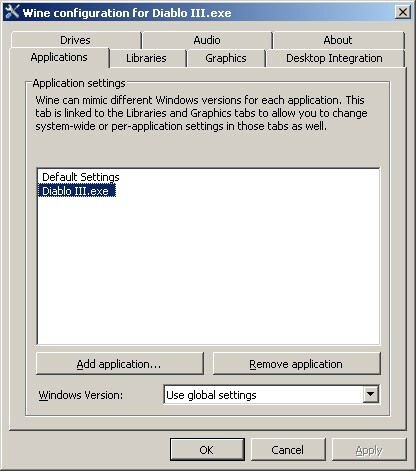 Browse to [Program Files]>[Diablo III], select “Diablo III.exe’ and select [Open]. Select the [Libraries] tab again, enter dbghelp in the [New override for library] field, then select the [Add] button. With the dbghelp selected in the list this time select the [Edit] button and select [Builtin], then [OK]. 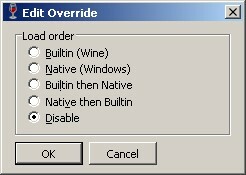 Now select [OK] in wineconf and close the remaining PoL configuration window. You will now be able to run Battle.net which not only allows you to run the game but also handles game updates. Just want to say thanks and the workaround does work. Nice! Will try this out when I can. Thanks for the link luke10. 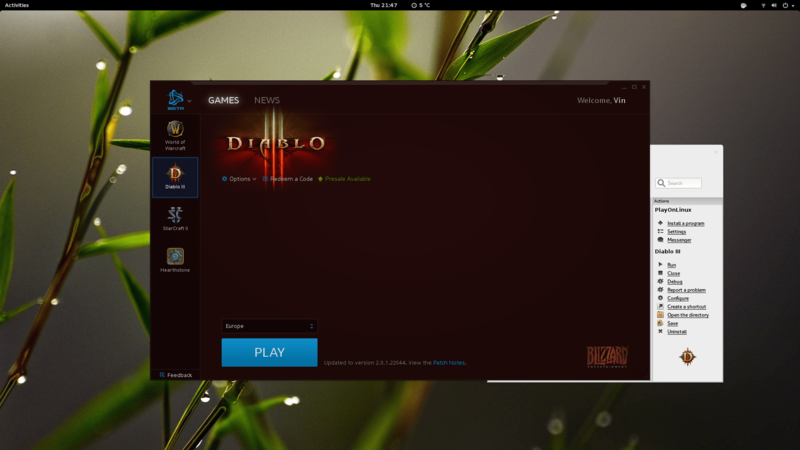 Is there a workaround to complete the initial install of Diablo 3? My Battle.net launcher crashes before install even begins. 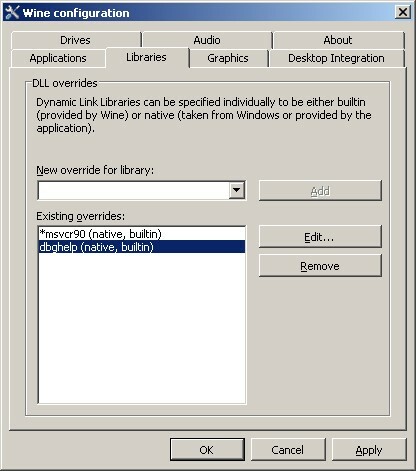 Running Battle.net in a recent version of Wine along with the disabling of the dbghelp library will stop Battle.net from crashing.